The garden is a work in progress. 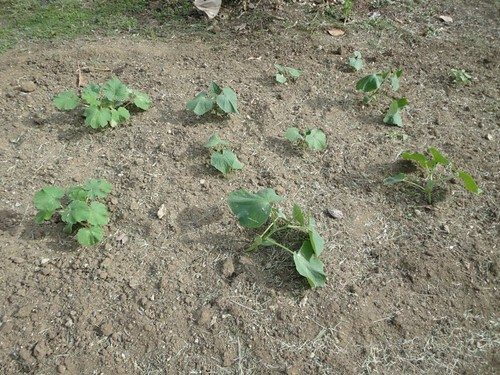 The cucumbers are doing really well. They’ve only been in for a few weeks. 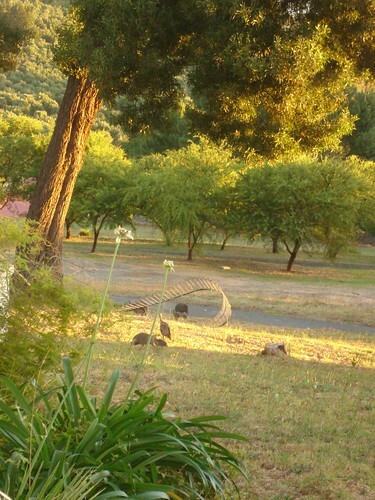 The plants on the far left of the picture are zucchini. We also have tomatoes and rock melon in as well. This picture shows the garden in it’s full glory. 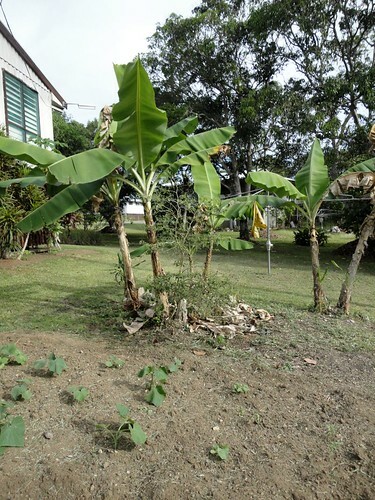 I love the banana trees. It’s the dry season here at the moment, so it’s very hot and dry. There’s been knitting going on. I’m loving this beaded cowl. It’s from handspun. 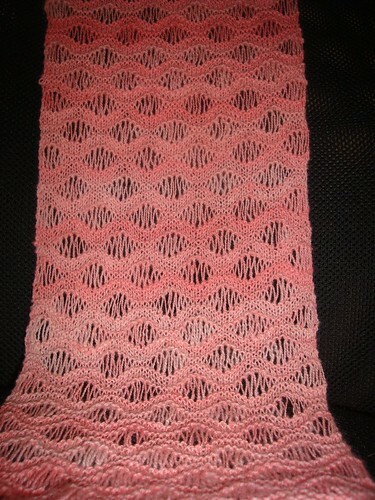 It’s leftover from a shawl I knitted in 2010. 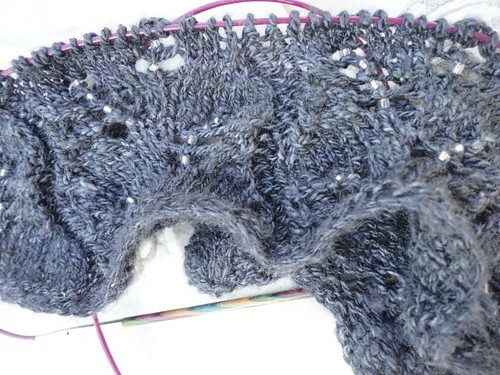 Because beads and lace are too complicated to take out of the house I cast on for some take along knitting. 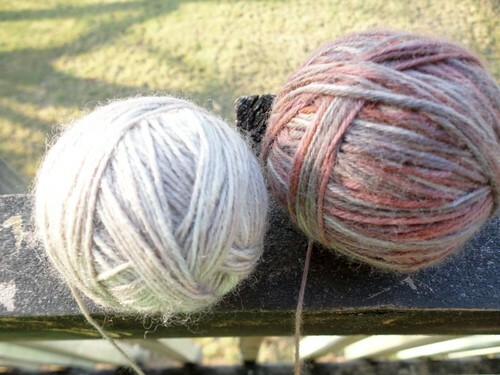 I took these two balls of Nurturing Fibres sock yarn and paired them up. The ball on the left is left over from socks and the one on the right is left over from a hat. 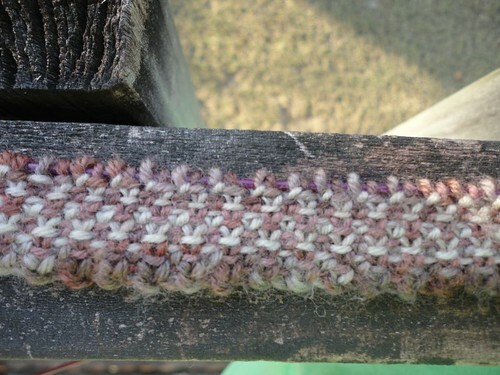 I’m turning it into this linen stitched scarf. At 400 stitches per row it’s taking a while to build up width. I have to admit that I’m loving this stitch and the effect of the colours shifting as I knit. 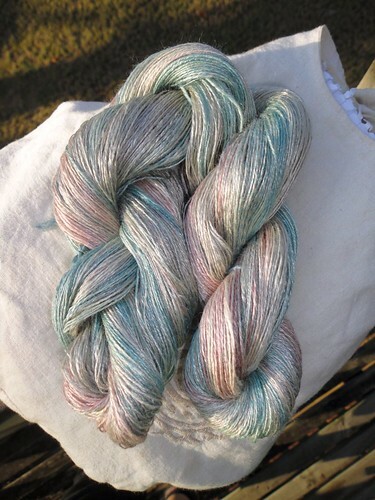 I also finished spinning some silk. It hasn’t been washed or set yet. There’s been fires around and I haven’t wanted to put it outside to dry. I’m pretty pleased with this. I think it’s actually thin enough to embroider with if I was so inclined. For not having a working car over the Christmas break. We are certainly saving money – no ducking out for take-away or hitting the shops for some post-Christmas shopping. Gorgeous Man received a multitude of tick bites while he was away, and unfortunately has a dose of African Tick Bite Fever. If you Google it, you will see some lovely images 🙂 I’ve just linked to a medical explanation with no pictures. I hope you all had a wonderful Christmas (if you celebrate the day). Our Christmas was lovely. Gorgeous Girl had lots of fun delivering the presents around the room, and opening hers. 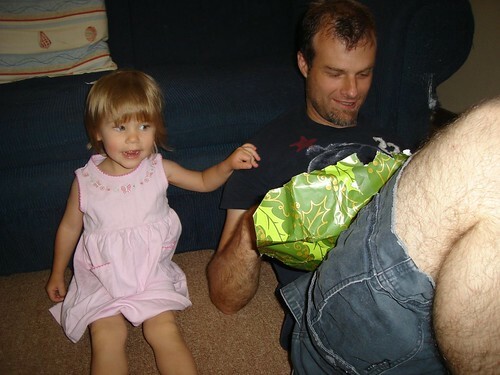 I just love this picture of her helping Gorgeous Man to open his gift. She helped to wrap it up. Gorgeous Man’s mother gave her a plastic tote filled with crafty stuff and she has been gluing and painting and cutting to her hearts content since Christmas. My house looks like a confetti bomb exploded. She can’t cut out pictures, but she can certainly cut up the paper into lots of little bits, not too bad for 26 months. I finished some spinning. This gorgeous stuff. 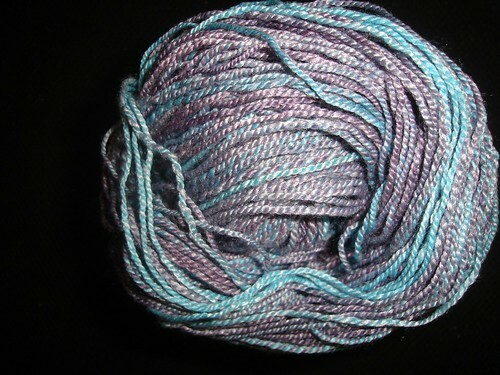 Merino and bamboo in a colourway called Concord Grapes. came from the Portland Fiber Gallery in Maine. Gorgeous Man bought it for me at the same time as he got the wheel. If you want some of this fibery goodness, you can check out their Etsy store. I don’t know what this is going to become yet. 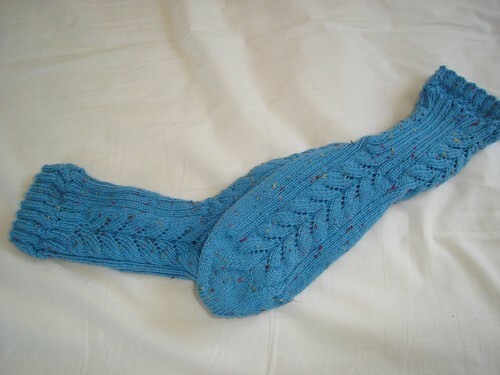 Before Christmas I participated in Kirsten’s Mystery Sock Knit Along. 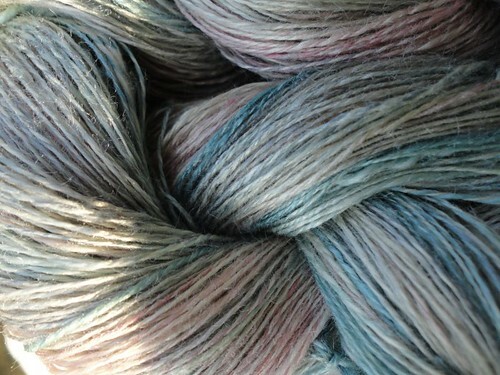 It was lots of fun, and I got to use this yarn that has been marinating in the stash for quite some time. Inspired by the Santa layout, I did another layout for Gorgeous Girl’s scrapbook. This one is of her enjoying the chooks (Australian for chickens) at Gorgeous Man’s dad’s place in July. 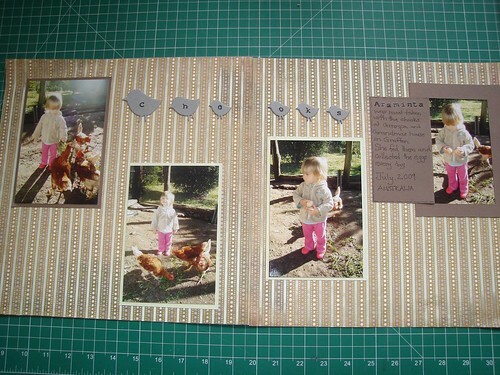 I’ve decided that (once the car is fixed) I’m going to take a scrapbooking class. The newsagent at the local mall also has scrapbooking supplies and they offer classes. The classes are always on while I’m working, but I’ve got some leave coming up. I think it will be fun and it will give me some dedicated time to work on it. 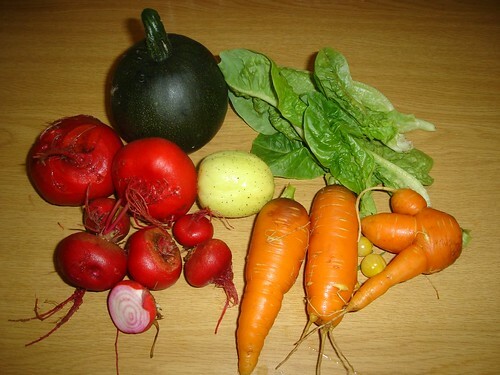 Since it is summer here, we have been enjoying some bounty from the garden. This is the second lot of carrots that we picked, and the last of the lettuce. There are more carrots in the ground, but we tend to pick as we need them. 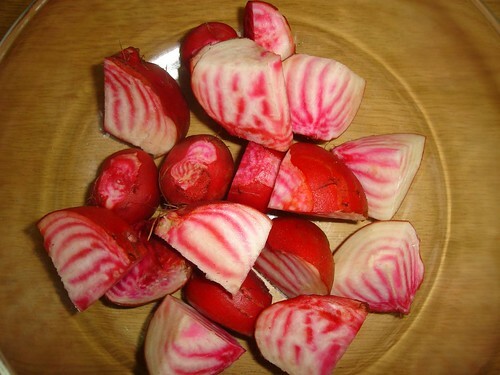 The beetroot is an heirloom variety that grows red and white rings, I think it’s very cool. The dark green round thing at the back is a gem squash. 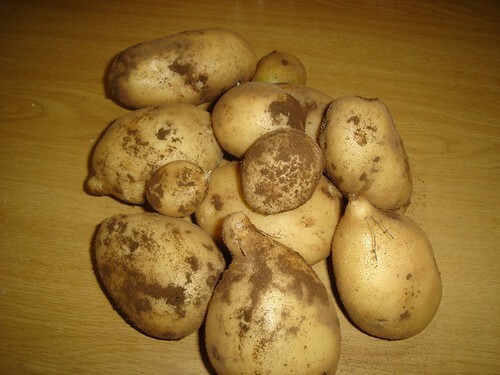 We hadn’t had them until we moved to South Africa, but they are very tasty. And the light green round thing is an heirloom variety of cucumber – very fresh tasting. The corn is now much taller than me (Gorgeous Man will tell you that this is not hard lol) and has lots of heads on it. We also have three varieties of pumpkin coming on. The watermelon is flowering, so we are hopeful that we will have some home grown watermelon before the summer is out. I started hand quilting the fish quilt, but my frame has gotten brittle with age (it’s plastic) and is no fun. Also, it’s huge (what was I thinking!?) So I’ve set it aside until (I have the car back and) I can get to my local quilt store. I’m hoping that I’ll be able to convince the owner to do it on her long arm. Otherwise I’ll have to look for another long-armer in the area – easier said than done. 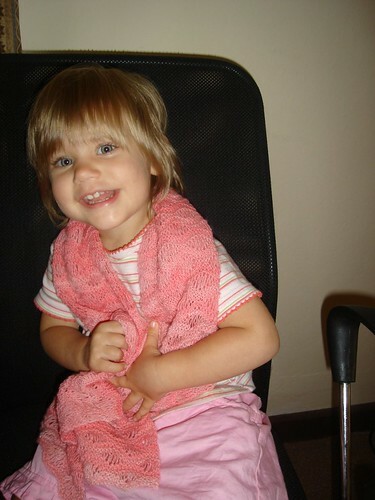 I’m also making a skirt for Gorgeous Girl – the tutorial one looks really cute. Let’s just say I’m going to reserve judgment on my version until it is finished.